RM Cullen are delighted to be taking part in the Hannath First Time Buyer Evening on Thursday 18th January. We will be available to talk through the legal side of purchasing your own home for the first time! 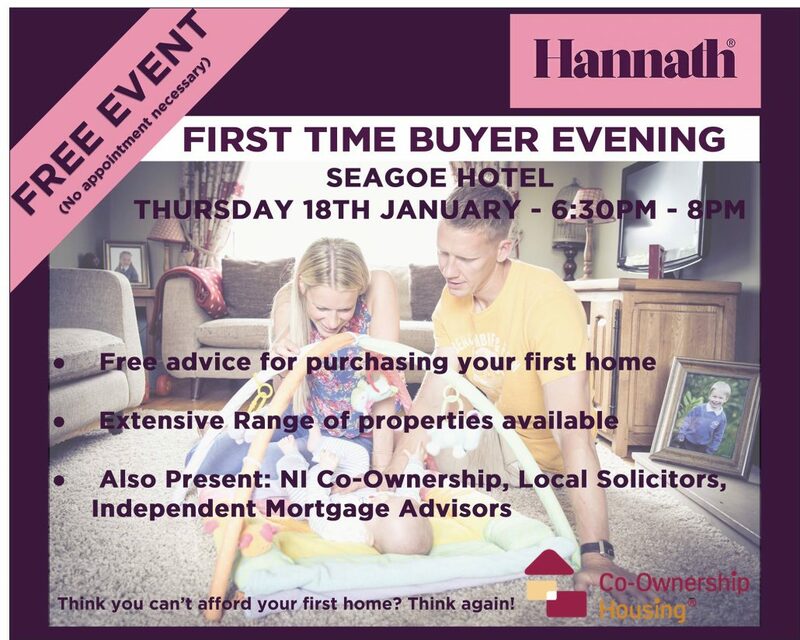 Come along to the Hannath First Time Buyer Evening at The Seagoe Hotel on Thursday 18th January, 6:30pm – 8pm. ● Free advice for purchasing your first home. ● The Hannath Team will be on hand to show our current properties suitable for first time buyers (New build and resale) and to answer any questions you may have about purchasing! ● NI Co-Ownership representatives will be there to answer any queries you have about getting your own home through the Co-Ownership Scheme! ● Independent Mortgage Advisors in attendance to offer advice and discuss all your financial options. Think you can’t afford to buy your own home? Think again! Come and see us on Thursday 18th, 6:30pm to 8pm! Stamp Duty is a tax charged on certain transactions. Historically the evidence of the transaction was a document which required a physical stamp e.g. a Transfer Deed of a property. The modern version of the tax no longer requires a physical stamp. Today, the most common form of the tax that you will come across is Stamp Duty Land Tax (SDLT), when buying a property or land over a certain price. The tax is administered through HMRC and the rate of tax paid is subject to change by the Chancellor of the Exchequer and the Government of the day. The current SDLT threshold is £125,000.00 for residential properties and £150,000.00 for non-residential land and properties. How much SDLT is paid will depend on a number of factors such as the price paid, when it is paid and how it is paid. HMRC have a very helpful SDLT website and helpline telephone number, which can be contacted to help calculate the SDLT that will be payable. Also, as solicitors, we are able to advise on the SDLT liability in most cases. How and when do I pay SDLT ? SDLT is reported and paid by way of an SDLT return, which can be lodged online. You must send the return to HMRC and pay the tax within 30 days of completion of a transaction. Even if no tax is payable, there will still be situations in which a return must be completed and submitted to HMRC within this time frame. If the return is not submitted in time or you fail to make a return at all then you may be charged penalties and interest. Part of the conveyancing service we provide as solicitors includes helping you to prepare and file the SDLT return and to forward your tax payment to HMRC on your behalf. Change in Rules in April 2016 – What if I already own property and buy another? Due to a change in the SDLT rules in 2016, you will usually have to pay 3% on top of the normal SDLT rates if buying a new residential property means you will own more than one. However, you won’t pay the extra 3% SDLT if the property you are buying is replacing your main residence and that has already been sold. If there is a delay selling the main residence and it hasn’t been sold on the day you complete your new purchase then you will have to pay the higher SDLT rate because you own two properties, but you may be able to get a refund if you sell your previous main home within 36 months. Due to the complexities of the SDLT tax rules, we recommend that you obtain legal advice in establishing the level of SDLT you will be liable to pay in your anticipated proposed transaction. Are you thinking of buying a house? Are you saving for a deposit on your first house purchase? If the answer is, yes, then the government’s Help to Buy: ISA Scheme may be an opportunity for you to top up your savings with a bonus up to a maximum of £3,000.00. you will require a mortgage to help with your purchase. One person cannot open more than 1 of these ISAs, but 2 people buying a home can each have an ISA and lump their savings and bonuses together towards the purchase price. What is the catch? There are rules on how much you can deposit; the minimum period the ISA Scheme must be open before claiming a bonus and obviously the balance in the ISA and the bonus must be used for your purchase. However, it is otherwise like a standard ISA. The more you save the more bonus you are eligible for, up to a maximum of £3,000.00 from the government to top up the value of your savings. As with all investments “terms and conditions apply” so we recommend that you seek advice about the Help to Buy ISA from a financial adviser before deciding if this scheme is right for you. You can also find out more by following this link to the government website https://www.helptobuy.gov.uk/help-to-buy-isa/how-does-it-work/. It is difficult in our busy computerized and internet driven offices to imagine a more leisurely time when the Solicitors acting for the Vendor and the Purchaser completed a sale of property over a glass of sherry in the offices of the Solicitors acting for the Vendor. Our offices have been open in Edward Street, Portadown since 1907, before the founder of firm Robert Martin Cullen (known to one and all as “RM”) went off to join an Irish Regiment, the Connaught Rangers, based at Renmore Barracks, Galway, to fight in the Great War. Looking back over the records and memorabilia we have from that time, there are indeed references to completing a transaction over a glass of sherry. We have posters of auctions in the 1920’s of farms “including ewes and the ram running with them all season”. We have the gown that in those days of yore the young RM wore to Court when Solicitors as well as Barristers wore long black gowns. We have references to his going to Clonmakate Petty Sessions on a pony and trap where we understand that very much in the fashion of the TV series “An Irish RM” the locals gathered every month for a bit of high entertainment. Some of our clients still remember him as “old RM” on austere persona, tall and slim with a winged collar and utterly principled in all matters. His portrait hangs in our offices today, as does the portrait of his son, Jim Cullen who carried on the fine tradition set by his father. Today we do our absolute best to adhere to the high standards set for us by our predecessors in R M Cullen & Son but alas, we never have time to “complete” over a glass of sherry, or indeed, the modern equivalent, a cappuccino! The weather this summer might not be good but caravans remain very popular and many people invest money in the purchase of a caravan to station on one of the numerous caravan sites available, both in Northern Ireland and Republic of Ireland. People commonly purchase their caravan with a particular park in mind and may assume, if purchasing from a Park Owner, that the price they pay buys both the caravan and the permanent right to locate it in the park. Difficulties can arise if agreements are made by word of mouth, or where written agreements lack sufficient detail. The most common written agreement between a park owner and a caravan owner is in the form of a Licence. A Licence is simply a permission to use land for an agreed purpose. A Licence does not confer any legal interest or rights in the pitch on which the caravan is located. This means that the caravan which is being purchased is only permitted to remain on the park site for as long as the Licence permits. It is vitally important that before purchasing a caravan, a purchaser should be aware of the terms of the Licence agreement offered by the park owner. The introduction of the Caravans Act in Northern Ireland in 2011 has helped because the Act requires that the owner of the caravan park must give the purchaser of a pitch a written statement which includes particulars of the pitch on which the purchaser is to station the caravan, and sets out the express terms of agreement. These terms should include the duration of the agreement, pitch fees, periods during the year when the caravan may (and may not) be used, the Park’s rules, how the Agreement can be terminated by either party, and the rights or obligations of the parties in relation to any matters likely to arise during the lifetime of the agreement. This could include moving the caravan, access by the park owner to the caravan, sale of the caravan, whether the agreement can be gifted to a relative, restrictions on use of the caravan, insurance, maintenance and repair, services, and facilities to be provided. A park owner may be entitled to insist that the caravan owner upgrade their model, or he may make renewal of the Licence conditional upon such upgrade. This can be extremely costly and it is therefore vitally important that the matter of upgrades are addressed in the negotiations at the time of purchase and included in the Licence agreement. In general the terms of any contract are subject to a test of fairness under the Unfair Terms and Consumer Contract Regulations 1999. The Caravans Act only covers caravan parks situate in Northern Ireland. If you are seeking to station your caravan in a Republic of Ireland park then it is vitally important that an agreement is put in place with clear terms negotiated and agreed between the parties at the outset. Legal advice is recommended and our litigation partner, Kathy Robinson, would be pleased to help.